Congratulations to our safe of success winners. They were all chose as winners through our random generators today. Summer-Jade and Bromley won their prizes for their progress in Maths, Kyle and Shannon for their progress in Reading and Adam and Millie for their progress in Writing. 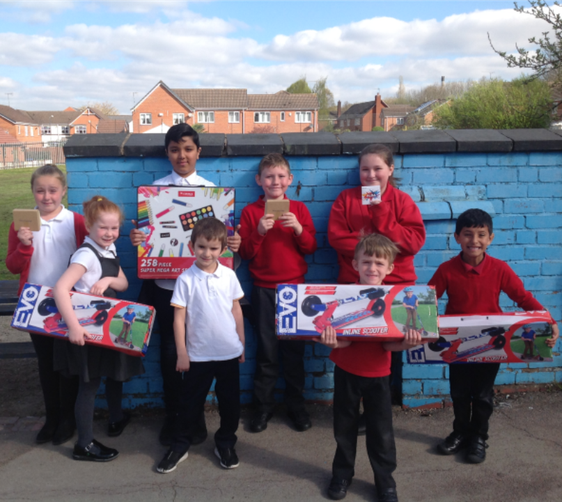 Erand and Zain also won art packs for 100% attendance this term. Every pupil that achieved 100% attendance this term has received a 100% attendance pencil and a sticker too! Finally, Unicorn accumulated the most house points this term and received their very own Unicorn pencil.